Some industry watchers are concerned that iron ore prices will fall into the mid-$80 per tonne levels again, testing lows reached in 2012. The price of iron ore has already fallen 20% or so to the $100 level, so big miners like BHP Billiton and Rio Tinto are already facing headwinds. It could get downright ugly if iron ore falls an additional 10% to 20%. BHP Billiton is expecting steel production to grow at a little over 3% a year through 2020. Growth will slow after that, but should remain at around 2% until 2030. Iron ore is a key ingredient in the steel-making process. BHP got about a third of its revenues from iron ore in the first half of its current fiscal year (ending in June.) However, iron ore accounted for about half of BHP's profits. 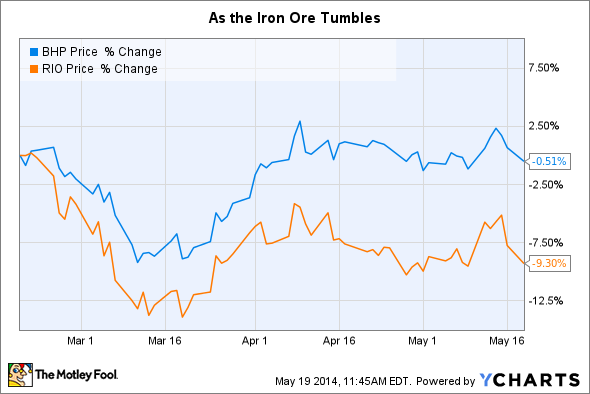 Rio Tinto is even more reliant on iron ore. In 2013, the miner generated nearly half of its revenues from the sale of just this commodity. Iron ore accounted for over 85% of its net earnings, however. A constructive long-term outlook for steel production is a good thing for this pair. That's largely underpinned by the economic development of emerging markets. For example, BHP is projecting that 1.2 billion people will move into cities between now and 2030. Simply put, countries like China have no choice but to keep building to accommodate their changing societies. China isn't alone, either; it only accounts for about 20% of the population BHP expects to "urbanize." However, long-term and short-term trends don't always pair up well. Right now, despite still solid demand, there's too much iron ore supply. BHP explains, "Over the next five years supply growth is expected to exceed demand growth," and, "The majority of supply growth will be low cost." Australia and Brazil will be the main sources of new supply. However, supply exceeding demand is a recipe for disaster -- or at least low iron ore prices. And that, in turn, is a problem for BHP and Rio Tinto. Gavin Wendt, an analyst with industry-watcher Mine Life Resources, explained to The Australian, "At a time when there are question marks over the robustness of the Chinese economy and particularly its steel industry and its demand for steel, it's not surprising that we've seen the iron ore price retrace as it has." With iron ore hitting 12-month lows, it's no wonder that Rio Tinto shares are off nearly 10% over the last three months. Shares of BHP, which isn't quite as reliant on the commodity, have essentially been treading water. If BHP's estimation of supply is right, however, the next five years could be tough on this pair, not just the next few months. That's why BHP and Rio are both working to reduce costs. Rio is investing in automated trucks and trains, and the impact could be huge. It believes that autonomous trucks will have a 15% increase in utilization over regular trucks. Rio being able to push more material through its operations like that is akin to getting a raise. BHP is also working on automation. Both companies are also cutting back where they can and refocusing around their best investment opportunities. For example, BHP plans to cut its capital spending by 25% in fiscal 2014, with further cuts to come next year. Right now it's focusing on expanding its reach in oil and copper. Productivity and cost cutting is the name of the game elsewhere. Both BHP and Rio Tinto will wax and wane with the performance of their large iron ore businesses. Iron ore has a solid long-term outlook, and both companies have operations outside of that space and a keen focus on improving their productivity and cost structure. If you're looking for a diversified miner, any iron ore-led weakness could be a buying opportunity in this pair of industry giants. The article These Mining Giants Could Be in for a Tough Ride originally appeared on Fool.com.